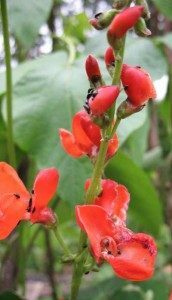 We do not usually suffer from blackfly on runner beans. Our vegetable garden is in the north of the UK where we normally have cool, damp summers. 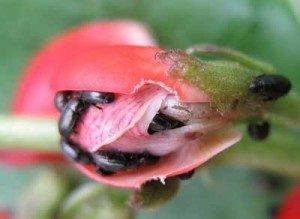 Blackfly, like all aphids usually thrive in hot, dry conditions! 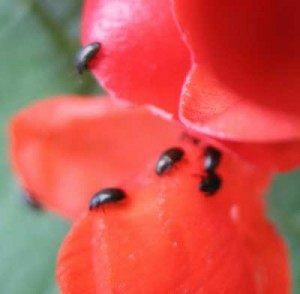 Blackfly are attacking the runner bean flowers in quite large numbers. 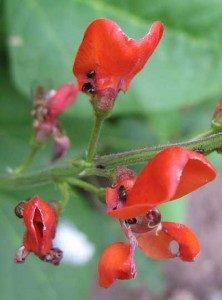 Something has to be done as they are sucking the bean flowers and causing significant damage. The problem is how to proceed. Option 2 will have more of a sledge hammer effect – instantly getting rid of the blackfly & immediatley relieving the beans of their problem. But other insects will suffer, too. 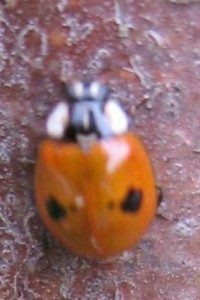 Ladybirds eat blackfly, and now there is a decent pool of blackfly to feed the ladybirds, the ladybirds will start to multiply. 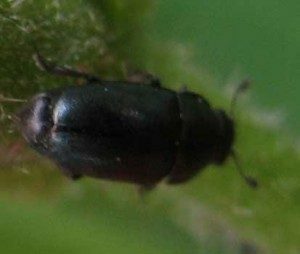 So the quandry is can we afford the time delay whilst the ladybirds build up their numbers, during which time the blackfly do more damage to the runner beans? We will try option one for a day, see what happens to the blackfly, and watch the ladybird numbers. We saw the first ladybird this morning! 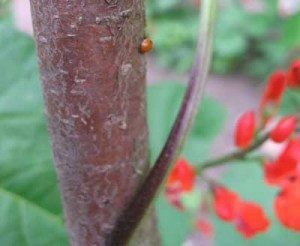 Watch out all those blackfly on the runner beans! Our runner beans are surrounded by hoverflies, and their larvae will eat & also control the blackfly on the runner beans. The following photo shows a hoverfly on a runner bean flower – it is on the top left of the photo. Unfortunately it is much easier to see the blackfly on the runner bean plants! 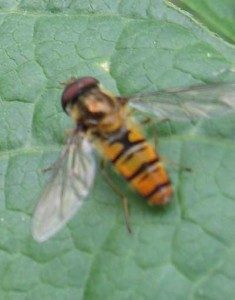 The hoverflies mimick wasps by having the same colouring, so they are left alone and avoided by other animals! There is always a time lag whilst the controlling insects build up their numbers, & the pest increases. Hopefully the ladybirds and hoverflies will soon have the blackfly on the runner beans under control!